It is a comnon notion that the figure 8/hourglass shape is the bestshape well in a way it is because fat is evenly distributed but not everyone has this shape this doesn’t make them ugly, you just need to be able to dress your shape. I did a little research and from my research I found out there are four main types of shapes. Apple shaped- also known as the circular shape is characterized with small limbs(legs and arms), big bursts, protruding stomach. Avoid- Avoid dresses and belts that pinch at the waist. Avoid drawing attention to waist and shoulders. Avoid skinny jeans. Wear- wear long sleeves. Wear flared trousers. Wear dark colors they give a slimming effect. Wear patterns and print on the lower half of the body. Wear V necked clothes . Rectangular shape- Also known as straight shaped, these individuals are not curvy, their waist and hip and burst are usually same or 2-6 inches different. Avoid- Stay clear any men’s clothing like baggy jeans. Avoid big flowing gowns like A shaped gowns. 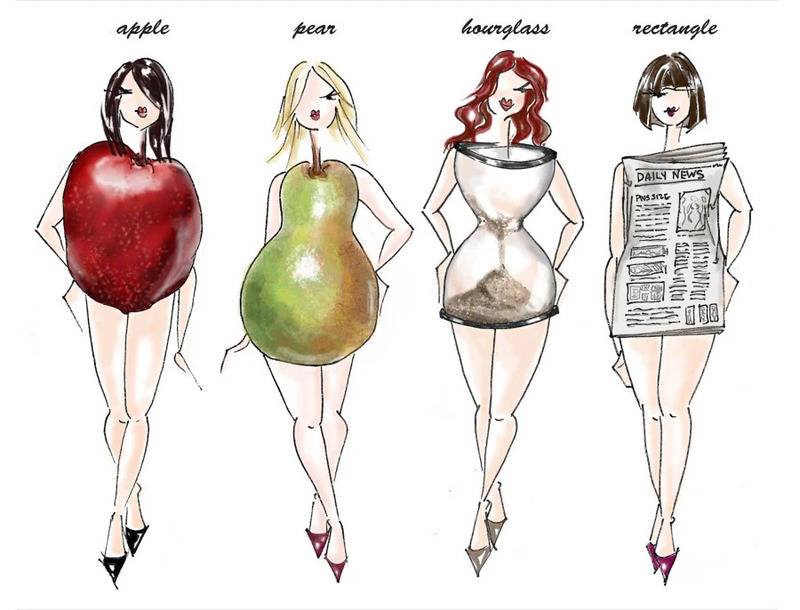 PEAR SHAPED- The opposite of the apple shape, these individuals have wider hips and legs, shoulders are narrower and not as broad. Avoid- anything that draws attention to the hips, like partterns and prints. Wear- Anything that accentuates your shoulders and burst. Wear straight legged or slightly flared jeans. Wear heels. Wear wide necked clothes. Wear clothes with puff sleeves or shoulder pads. Hourglass shape- Hips and burst usually the same measurements, while the other waist is slimer. Avoid- anything that makes you look boxy and draws away attention from your waist. I love this, and I especially love how you emphasized that every woman can feel beautiful in her body and clothing – no matter her shape or size! I love the visual picture. Really helps me to understand the shapes better. Thanks for sharing. That picture is so funny, I used it in one of my school projects! This post is so true, thanks for sharing! Lolzz, you welcome, thanks for visiting also. You welcome😘 thank you also. I liked the advice. I do, however, like relatively skinny jeans and I am an apple. Now I have to rethink. Super helpful! I am an hourglass, and you hit the nail on the head. I just want to point out– a figure 8 shape does not necessarily mean that fat is evenly distributed. It is just the way the bone structure is 🙂 otherwise these are very helpful tips. thanks for sharing these helpful tips! i love reading such. You welcome, thanks for visiting. What a helpful post! I have a pear shape and I love wearing straight or skinny jeans with heels! I can’t decide which shape I am, lol. I need to think about this for a bit. Thanks for the tips!